﻿ Best Price on Hotel Boutique La Casa de las Flores in Cahuita + Reviews! 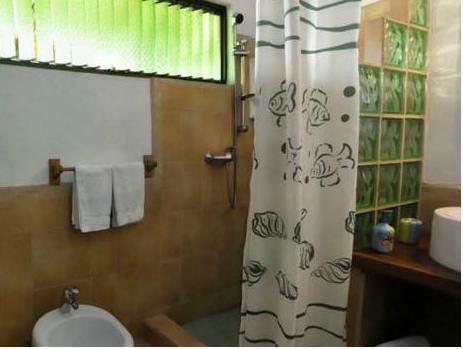 Hotel La Casa de las Flores is located in Cahuita, only 755 feet from the bus terminal and shopping mall. It offers its guests complimentary Continental breakfast and free Wi-Fi access. The accommodations feature a modern and minimalistic-style décor, air conditioning and cable TV. The private bathroom provides a hairdryer and free toiletries. Guests will be able to find other food options within 328 feet from the hotel, mostly small eateries. Hotel La Casa de las Flores has gardens and sun terraces. Solar panels are in charge of heating the water of the property. Also available are massage and luggage storage services, a library and a tour desk. La Casa de las Flores also has a swimming pool. Cahuita National Park is 656 feet from La Casa de las Flores, and The Jaguar Rescue Center is 9.3 mi away. The Cacao Museum may be an interesting place to visit and is 3.1 mi from the hotel.